As many as 170 people were arrested in Oakland after protests erupted in the days following a grand jury decision in Missouri to not indict the officer responsible for the death of Michael Brown. 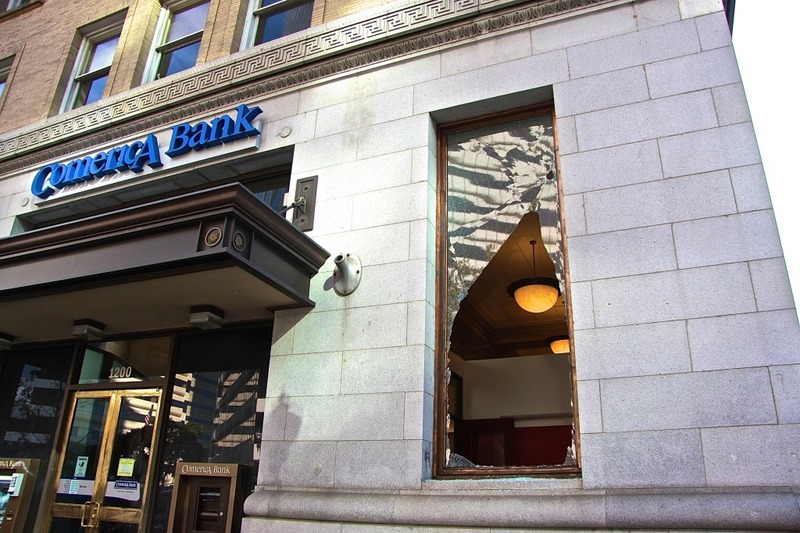 Over three nights, arrests were made in connection with vandalism in the Temescal and downtown areas, as well as attempts to shut down local freeways. Oakland is feeling the effects of protests that swept the city after Monday night’s news from Ferguson. Vandalised businesses are boarded up, some closed. The police department announced that 43 were arrested during Monday’s protests. The Republican and Democratic candidates for California Secretary of State faced off in Berkeley last week, less than a month before the pair faces off again at the polls in a tight race for the job of the state’s top election officer. After a summer of bombing and fighting between Israel and Gaza, Jewish leaders in Oakland are grappling with how to address the violence and ongoing Middle East tension within more traditional thoughts about the fall’s Jewish High Holidays, which focus on starting new and letting go of the past. Oakland residents showed support at last night’s City Council meeting for an ordinance that limits the construction of new crematoria. Councilmembers also voted on a Jack London Square redevelopment and recognized community volunteers and organizations.